in engaging with research on it is also very clear in every thread where you have discussed it. early philosophers that the concept of god is a natural a priori one we are born with. Thank you very much for retracting your statement. Although I do consider myself Atheist at the present, I would also like to add that when both of my parents died last year, I prayed for them. Hard. I would also like to say that if I see a sign from God, I will accept it. I guess that makes me a pseudo-atheist. parents passing away last year. This must have been hard. nature, which we all know deep down. We are all born atheists. Newborns no nothing of the outside world, Gods or magic. You know so little and assume you know much. Becoming an atheist can be as varied as there are people. It is easy to express an uninformed opinion There are many atheists sites worldwide that can help you better understand what atheism is for an informed opinion. Scepcop wrote: Now, I don't think anyone is born an Atheist. Usually we all believe in God when we are children, and that there are "magical" or supernatural forces in this world. So I'm wondering, what event in your life turned you into a skeptic or an atheist or both? What was your Eureka moment? I have a theory. Many skeptics become that way due to some tragic event in your life, which you blame God for, and then you retaliate by denying God and starting down the path of atheism, denying all supernatural things in the universe altogether. But few like to admit this though. If this was the case with you, can you share your story? Was is a slow process or an instant one? What caused you to doubt the supernatural and God? Was it skeptical literature? James Randi? Or an angry hatred toward God? Actually nothing caused me to become an atheist. I realized at an early age that beliefs in God or gods didn't make a bit of sense. has believed in these things since time immemorial. Atheism is a modern invention. Scepcop wrote: Which, specifically, are you asking about? It sounds like you're making the assumption that in order to be a skeptic, you are an atheist and vice versa. These are two very different subjects and I have different reasons for both. Well you are free to present your reasons for both. As for being a skeptic, I had family members who wasted thousands of dollars on psychics. They have spent money on advice that turned out wrong that caused them financial and emotional harm. The moment that set me over the top, however, was watching Sylvia Browne tell Shawn Hornbeck's mother and father that he was dead. I just can't imagine why someone could do that to a family. She is obviously a fraud, and until I can find someone who is genuine, then I will do what I can to ensure nobody does something so disingenuine again. Research into the world of psychics based on that story has led me to research into all other paranormal issues and to where my beliefs, for the most part, rest today. As for being an Atheist, while at war in the Middle East 5 years ago, one of my many jobs was to notify the home-base Commander of fatalities and wounded. I saw first hand the horrors of war, especially religious wars, and came to the conclusion that there could not be a good, all-knowing God who would let this happen to his world. So, I dusted off my old-Bible and started trying to make sense out of it. The more I read and the more I researched, the more pissed off (can I use that term?) I got as to how I was duped into believing that crap for so long. Christians have come up with some lame excuses, but the bottom line is that the New Testiment offers different names for Jesus' 12 apostles in different books. The Old Testiment has a different set of commandments. I mean, those are two of the most important works in the Bible and these "writers from God" couldn't even get that right? As for being a golfer, well, what can I say, I enjoy being outside, walking through freshly mowed grass than couped up in front of a computer trying to figure out some new conspiracy. But hey, that's just me. I see. I'm sorry about those losses and the horrors you experienced. I thought you said you were pro war though? As to psychics, during your research, what did you make of the psychic cases that are unexplained or that came true? I mean, yeah some may be frauds, but what about the genuine cases? How did you fit them into your paradigm? I can understand how you feel about God and the Bible. I often felt the same too. Theologists throughout history have never been able to justify the existence of evil, suffering and injustice with the idea of an all good God. But why not believe in a God that is not all powerful, one that is limited then? Harold Kushner, author of "When Bad Things Happen to Good People" advocates that view in his book. You do realize that there are forces beyond our senses that we can't explain or fathom right? PS - I do not think Indigo Child meant to be rude to you. He was just pointing out that perhaps you rushed to judgment too quickly, and did not consider all the evidence to the contrary. I would agree with that. It is just an observation and recommendation. Try to have a thicker skin and not take everything so personally. Scepcop wrote: I see. I'm sorry about those losses and the horrors you experienced. I thought you said you were pro war though? No, I'm not pro-war in the least. There are times when, unfortunately, it is necessary but I wish it wasn't. As for psychics, I just haven't found a case that doesn't have questions surrounding the facts. For example, I was initially pretty impressed with Ginette Lucas and her supposed phone call to a PI in Orlando telling him where he could find the body of Casey Anthony. But it now appears there is more to the story than meets the eye. The PI may have actually found out from another source where the body was and he used Lucas as his excuse. I'm not saying this happened, I'm just suggesting that there are questions surrounding that case as there appears to be questions surrounding all cases with psychics. I keep in mind that no psychic has won the lottery, that no psychic has ever solved a crime, and no unknown facts have ever been revealed by talking to a dead person. As for the forces beyond our senses that we can't explain, well, that's kind of an iffy answer. We may not always know the "how" yet, but my conclusion is such that our five senses are so powerful that it creates the illusion of a 6th sense, but as for those forces being paranormal? No, I don't think so at this point but I'm open to the possibility. As for a God that is not all powerful and limited in abilities, what's the point of praying and believing in a god that can't help? As for having thicker skin, well, maybe I just shouldn't play into other's schemes. But when a person says I shouldn't comment on this because I'm a pseudoskeptic whose traits are name calling, and then get called a "mindless zombie" and a liar among other derogatory comments, I think it's human nature to get defensive towards this hypocritical statement. A great question Skepcop, and a fair one. I do think that your theory is too much a a generaliation, but I am sure there are cases were it is accurate. There was no big life changing event that made me into a skeptic & an atheist. Rather, it was a long slow process. There were milestones to be sure, but they were small steps in a long journey. Like my transformation, this post also promises to be a long journey. You may wish to pack a lunch for it. I feel the only good way to explain how I reached the point I am at today is to tell you some things about my life. I know you won’t mind because I am a fascinating individual and even the most trivial detail of my existence is intensely interesting to the average person. I grew up in a household that were nominally Baptists. We did not attend church regularly, but it was pretty much accepted by all that the Christian God did indeed exist, and the bible was basically true in all important details. My parents divorced when I was eight, my mother got custody of my brother and I. We three all lived together in the house that my mother and father had bought when they married. The reason I mention that is that we three were all believers in the supernatural & paranormal. We all read the same books, and discussed such topics together at length fairly often. I think that I actually outstripped the others in the amount of reading I did as I grew into a teen. I read the Amityville horror when it was first published in paperback, and stayed up until three am on a school night to do so. I was so freaked out when I finished that I am surprised I was able to sleep at all! I recall being a jittery exhausted mess the next day at school. Lol The point I am getting to is that I grew up in an environment where the paranormal was accepted and I could indulge my interest in it all I wanted. This was the 1970’s and there was no shortage of reading on the topic. In 1973, when I was nine years old, I heard that an amazing person named Uri Gellar was going to be on the Tonight Show with Jonny Carson. I heard that he possessed amazing powers like bending objects using only his mind. I eagerly tuned in to watch him perform his feats, and was disappointed when he failed. At the time, his failure held no real significance for me. I took him at his word that he was simply not “strong” that night. It seemed reasonable to me. As I grew older, I developed a curiosity about how such things as ghosts and psychic powers might really work. I wanted to know the nuts & bolts of it, as it were. I started to do more side research some of the ideas that were being presented in my regular diet of paranormal reading, but did not have a lot of success getting answers. I enlisted in the US Navy at age 18, and ended up as a gas turbine mechanic on the destroyer U.S.S. Thorn, DD 988. Living in larger cities, I had access to larger libraries, and thus much more reading material. I was still an avid reader on paranormal topics, and I was still hunting for answers. All the time my list of questions was getting longer. In an effort to find those answers, my reading became more diverse. I had been trained in mechanical engineering by the Navy’s advanced technical program, and had gained a good understanding of troubleshooting techniques. This may have been one of those milestones, as it gave me a new way to look at my questions. I started to read more about science, logic, critical thought and similar subjects. There is a difference between evidence and proof. It is just not possible to objectively know the truth about some things. These are basic concepts, and may be obvious to others, but they each represent a milestone in my intellectual development. Though basic, their implications are enormous, and they still inform my basic mental outlook to this day. As I continued into my adult life, I began to question not only the workings of reported paranormal phenomena, but for the first time in my life, the reports themselves. I recalled an episode from our teen years; my brother and I made a hot air balloon and launched it one warm summer night. Little did I realize we were also launching ourselves on the path to dreary, boring enlightenment. That balloon, glowing in the night sky, caused a UFO scare in our town. Reading of it in the paper the next day, we were amazed at the extraordinary abilities that the eyewitnesses bestowed upon our little balloon. Naturally, we immediately built and launched three more! By the time the “invasion” was over, we had racked up a respectable amount of press coverage and enough amazed eyewitness reports to give Area 51 a run for their money. All that from a couple of little balloons. We attached little significance to it at the time aside from the fun of a prank well played, but I did have this nagging little thought; the eyewitnesses had been completely convinced that our balloons had flown in formation, shot missiles, done impossible acrobatics and flown away at incredible speeds. How could they have been so wrong, and yet believe so strongly in what they were saying? I thought about it a lot. It had always seemed outrageous to say that all the people who made reports of strange goings on were lying or crazy or stupid. Now I saw that there was another choice. Normal, honest & smart people make perceptual mistakes very easily. It is part of the human condition. In fact it almost seems like we want to be fooled. It was a powerful realization. Definitely one of those milestones. Another very important concept came into my sphere of study about this time. It was the idea of the null hypothesis and the understanding that it was the most logical fallback position to hold in cases of unproven claims. This important concept, combined with other logical principles, may have been just about the final piece of the skeptical puzzle for me. I was about twenty five now, and had been having doubts about my favorite paranormal subjects being true for maybe a year; little nagging doubts that I shove to the back of my mind. I was still a believer, but somehow it didn’t all seem as clear to me anymore. Things from my past, such as Uri Geller’s Tonight Show appearance, took on a new light. It was then that I took a job as a wood carver at a prestigious furniture manufacturer. We made very fancy, handmade stuff with a high price tag. I am not exaggerating when I tell you that we had a couple cases that retailed for more than my first home cost me. I sat at a bench all day every day and carved flowers, scroll work, etc. into wooden furniture parts. It had a certain Zen quality to the work. I had a lot of time to think doing that job. Tap, tap, tap went my mallet. Click, click, click went my brain. After a couple of years of thinking, turning over what I knew in my mind, thinking about what I had read, I came to a point where I realized that I just did not really believe in the things I once had. It was not an easy thing to admit to myself. I had loved the paranormal my whole life, and still did. But if I wanted to retain my intellectual integrity, I had to confess that I did not have any objective reason to believe in these things anymore. I believed in them because I wanted to. They are attractive concepts and even the scary bits tend to have a comforting flipside. It was hard to let go. Very hard. But I asked myself what type of person I wanted to be. I wanted to be a person that had clear vision and to live my life with the greatest possibility of making sound judgments. Not just about the paranormal, but about all things. So I let my beliefs go. I screwed my courage to the sticking point and asked myself just that. I was forced to answer that I did not really know enough about my own religion to answer that. I began to read the bible like I never had before. I devoured it. I talked with others about it. I (gasp) went to church. I will not be specific here, but simply say that in my quest for the divine, I found only man. I found all his traits; wisdom & folly, Love & hate, compassion & cruelty. I did the unthinkable and admitted I did not believe in the god I had been schooled to believe in since I was an infant. I was not an atheist though, not yet. I went on a veritable rampage of theological study. Over the next few years, I read about all the major world religions, and some smaller ones like Wicca. By the time I was thirty, I had found much beauty, much wisdom, and little that I felt pointed to a true understanding of the universe and our place in it. I certainly found no deity. …and now here I am in my mid-forties, Happy and content, trying to make the most of my one chance at doing things right. I still read about the paranormal, still listen to other’s experiences with demons & gods. A very fascinating and entertaining read. It gave great insights into your thought process. dozens upon dozens I could cite. Indigo Child wrote: A very fascinating and entertaining read. It gave great insights into your thought process. Thanks for the nice compliment. I did try to make my post as interesting & enjoyable as poosible, so if you were entertained by it, I am very glad. On your critical point, I do not disagree with what you are saying, but I do not think it applies in this case. My story was not about the UFO phemoena or meant to be a debunking of it. I did not say or imply that my ballon story somehow revealed the nature of UFO's . As you say, using a single incident or explanation to try to dismiss all UFO stories would be too much of a generalization by far, and not critical thinking. This annecdote was included merely to show what I consider to be an important part of my change from believer to skeptic. In fact, to say that it applies only to UFO's is to diminish its importance to my skeptical growth. The story is about human nature, and my improved understanding of it. I apply it across the board to all questions where human perception is a factor,not just paranormal topics. While it may be no great insight, for me it was still a fairly important moment. I never use it as a blanket dismissal of evidence, but I do factor it in when it seems appropriate. I do not make any claims about myself when it comes critical thinking. I see critical thinking as a benificial pursuit and I attempt to employ its precepts to the best of my ability. Thise are objective statements that cannot be disputed without questioning my basic honesty. However, being human, I am subject to the same mental foibles that all humans have, and so I may not always achieve my goals in this arena. The truth is, I am still learning things all the time, and still striving to better my critical thinking skills each day. I freely admit that I will make mistakes in my thinking from time to time. I actually welcome it when people point them out to me, as that is when i learn the most. It does not follow that these mistakes nullify the entirety of my attempts to be a critical thinker, though. That would be an actual case of generalization, unless I am mistaken. Lastly, I was not trying to convert or convince anyone with my post. Winston asked a question, and I answered, it is as simple as that. I leave it up to the reader to make of it what they will. I have no doubt that opinions will differ and I am interested in hearing them all. P.S. I just thought I would add for the sake of the curious that I am undecided on the UFO phemoena. Something certainly seems to be happening here. I feel sure that there are a variety of explanations at work in the overall body of reports. The smaller percentage of reports that seem to have no verifiable explanation are by definition a mystery. If we ever get a solid objectively proven explanation for those, I am sure it will be fascinating in the extreme. the paranormal, one at most would be agnostic about it. few cases that are not explainable, are only not explainable in terms of conventional explanations. to anybody on earth and plus they violate our science. The simplest explanation then is they are ET. It's a really a case of putting two and two together. Which I find, in general, skeptics struggle with. Very, very true that just because most UFOs can be explained doesn't mean that some aren't genuinly alien. However, until there is solid evidence, then I will continue to think critically. Wish you would do the same. Well I choose to go with the null hypothesis until something is proven to me. From my point of view, that is a completely valid approach, and perhaps the best one. In my philosophy, belief must be warranted by evidence, but not believing or leaving the question open is the starting point and does not require evidence. As we all know, it is impossible to prove a negative anyway, so how could you ever have a case of evidence based disbelief? Point taken on the agnostic thing. I actually did call myself an agnostic for quite a while, but quit using that term for a couple reasons. First, and perhaps trivially, I found that people reacted to it with irritation. I guess they thought I was trying to worm out of something or to confuse them. That is my subjective experience, so other's results may vary. Second, and more importantly, while I allow for the possibility that there is something out there that might be termed a "diety," I really do not think it is true. I do not sense it, or see any evidence (in my judgement) of it, so in order to be true to myself, I use the term athiest. Bottom line: I do not believe in a diety, so it is accurate to describe myself as an athiest. So why all this interest in redifining what I call my self? I am just curious. I normally do not allow myself to be the point of discussion, but in a thread like this it is pretty much a given, so no problem. I came in here fully aware of that. So lets pretend I was to see your side of things and said "Yes, good point, I am not a skeptic and I am am not an athiest." What does Indigo get out of that? Any points that I make in conversation are still just as valid or bogus no matter what i call myself. So what is the fascination? I am not trying to argue, my friend, I'm just curious about this. UFO's.........hmmm. This is getting to be off topic in here, but I want to answer what your two points. I am not 100% sure that the few cases that are not explainable, are only not explainable in terms of conventional explanations. I feel that there could almost always be some piece of the puzzle that we do not have, but might render a natural explanation if we did have it. None the less, I am willing to concede the point for the sake of discussion in this thread. Mostly because we are now talking in generalities and I like to talk I terms of an actual cases. I get nervous making blanket statements about such things because it seems like thare is always something that could be found that you did not think of and falsifies a statement. But granting the first point for the sake of discussion, the second point you make is that the simplest explanation for UFOs is they are ET. You may be right about this, but maybe not. The ET hypothesis is only one a handful of non-conventional explanations for UFOs. We have absolutely no data with which to make a choice amongst these different theories. Choosing one at this point must be done simply on criteria of personal biases, and can not be arrived at rationally. This is why it is dangerous to put two and two together right now in the case of UFOs. We may very well discover later that one of our twos was in fact an eight, and why anyone that practices critical thinking should avoid it. How do you know that these physical flying aircraft does not belong to anybody on earth? You don't know that and can't even begin to fathom the secret aircraft the world's governments have experimented with. The top photograph being the Belgium UFO (and one I've seen myself. Twice.). The bottom is a rendition of the Aurora spy plane. 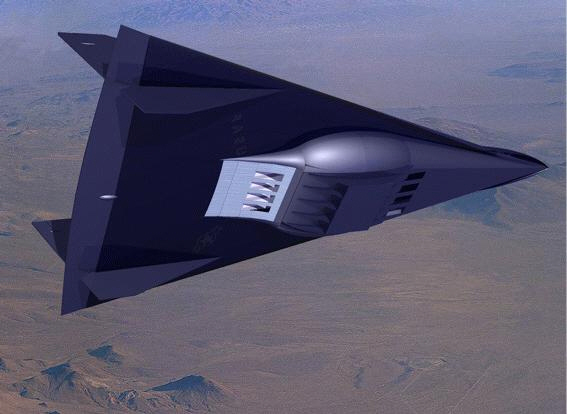 ProfWag wrote: How do you know that these physical flying aircraft does not belong to anybody on earth? You don't know that and can't even begin to fathom the secret aircraft the world's governments have experimented with. In 1991, I witnessed a triangle shaped UFO, that looked much like the top picture. However, it had three red round lights on each triangle end, rather than one in the center. It was silent, and remained stagnate in the air in the same position for several minutes, just hovering, not moving in the sky, and wasn't too far up above the tall trees. Then we drove away, came back about a minute or two later to look again, and it was gone. It didn't match the Aurora spy plane, what I saw.